Nothing can quite bring a halt to a nice evening sitting outside than sunset. As the sun goes down, temperatures immediately plummet, which is usually enough to stop anyone from sitting outside. Beyond having a camp fire - which isn’t the best idea your garden - there aren’t many ways to remain warm when outside once night falls. Whether you’re throwing a party, celebrating a birthday, or simply enjoying a few evening drinks with friends, there are many occasions that can be greatly enjoyed sitting outside. Having a patio or decking area makes this even more appealing, until things get too cold to bear! One of the best solutions for a cold night in the garden is a patio heater. These devices are popular in many beer gardens and restaurants with outdoor dining areas, helping to keep people warm long after the sun goes down. There are many types patio heaters available, which makes finding the best one for your outdoor living area quite the challenge. It helps to know what to look for in a patio heater and what types are best suited for these needs! The first thing you should think about is what type of patio heater you want. There are several popular options, any one of which may work well for patio or decking area. A full-size patio heater that stands completely upright, these are one of the best options when it comes to heating wide areas. They are commonly found in bars and restaurants, bearing a close resemblance to street lamp, albeit much smaller. They are a good size and can be easily moved around to various spots, making them quite handy for large spaces. As freestanding patio heaters are mostly powered by fuel, they usually don’t need to be connected to a power source. Usually much smaller, mounted patio heaters are designed to be secured to a wall, although some are hung from above too. They tend to be electric devices, so will likely need wiring to work, providing heat through infrared lights. Mounted patio heaters aren’t portable, so it’s a good idea to use them in smaller spaces where you sit regularly. The heat provided is still quite impressive, so they are a fine choice for many decking and patio areas. As the name suggests, table top patio heaters sit atop a table, heating those sitting around it. This is great for anyone that enjoys sitting outside on their garden furniture, although their portability makes them suitable for many outdoor activities. A much more compact patio heater, they can be powered by gas or electricity depending on the model. Heat outputs can be lower compared to more powerful models like freestanding patio heaters, so only invest in you plan on sitting it nearby. The size of the patio heater impacts how much heat it provides and the overall coverage of the heater. For example, a freestanding patio heater is the largest type available, offering around 40,000 BTU heat output on average, making it ideal for heating larger spaces. Smaller patio heaters like table top heaters offer a smaller heat output, typically around 12,000 BTU, as they are designed to cover smaller areas. While this may seem like quite a low heat compared to bigger models, it’s more than enough to comfortable heat anyone sitting round a table. As the smallest type of patio heater, wall mounted heaters offer the smallest heat outputs. On average, they offer around 3,000 BTU, although bigger models can offer a higher output in many cases. Patio heaters have various fuel sources, with the most common being propane, butane and electricity, while natural gas is becoming an increasingly popular choice too. Consider which fuel sources are mostly available and which are cost-effective, while also thinking about how this impacts the heater. For example, freestanding patio heaters using propane gas are highly portable and it’s very easy to install the gas, which will be a big selling point for many. However, propane tends to be costlier than other fuel sources, so be sure to think about this before making a final decision. Many people use propane as the fuel source to heat the greenhouse in their gardens. Natural gas is a cheaper option, which is why it’s becoming a more common choice for fuel, but not everyone has access to this type of fuel. Electricity is a much more eco-friendly choice as there are zero emissions and are much cheaper to run, but they do need to be connected to a power outlet outside, which can be an issue for some. Getting a professional electrician to install your electrical patio heater is a great idea. The size of a patio heaters reflector impacts how much heat is distributed, so you may want to look for products with suitably sized reflectors. Anything with a small reflector may not be worth buying, as this reduces the overall spread of the heat. A bigger reflector means more heat being spread around, offering a wider area of coverage that keeps more people warm! Patio heaters can be potentially hazardous in some situations, so it is important to look for suitable safety features when buying. Some of the best safety features for a patio heater include auto shut-down, safety tilt (should it be accidently tilted), shut-off switches in extreme weather, and heat adjustment levels. It is also worth investing in a patio heater with a good warranty. Some of the top manufacturers offer impressive warranties to indicate the overall quality of the product, so be sure to take advantage of this when possible. Below are some of the best patio heaters currently available! They cover various types, so be sure to check these out if you’re in the market for a quality patio heater! 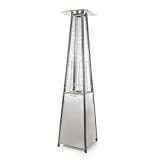 The Pyramid Living Flame is a very attractive gas patio heater with an impressive power output and plenty of great features. Sporting a stylish living flame when in use, this heater doesn’t just keep guests warm, it’s a stunning piece of outdoor décor that will illuminate your patio or decking. At 221cm tall, this freestanding patio heater offers ample heat with a powerful 9500W output, with the variable temperature control allowing users to get that perfect setting. The piezo batter ignition makes it easy and safe to operate, while the anti-tip feature also keeps things safe. Powered by either butane or propane gas, the A-shape design comes with a hidden storage compartment for the gas, allowing you to fully enjoy the stunning steel, aluminium and quartz glass design. The shape also makes it much safer, as the heavier base ensures a very stable heater that won’t be easy to blow or knock over. Using weather-resistant materials, the heater can be left outside in the elements without concern for rusting, while heat damage will also not be a problem. The Andrew James Outdoor Patio comes with an attractive design and an array of great features that make it a fine investment. Perhaps most notably, the freestanding design is completely adjustable, allowing you to set it to heights of 1.6m and 2.1m. This is great for both standing and seating, although the cool addition of a floating table at the centre means you can set drinks aside when standing. Using a double halogen heating element, the patio heater is fully electric so doesn’t produce any type of emissions. Connecting to an indoor power source shouldn’t be difficult either thanks to the large 3m cable, while the sturdy base includes wheels for easy mobility - perfect for using anywhere outside! Better still, this makes the patio heater much cheaper to operate! Gas heaters can be rather costly to run, so if you want to make some great energy savings then this a fine choice - it’s estimated this heater is around 70% cheaper to run compared to standard freestanding gas patio heater. The heat produced radiates up to 16 square meters, which is certainly enough for eating outside with the family or entertaining guests. It’s got a large reflector to help with this, while the stainless-steel design ensures protection from rust and corrosion. The Firefly 2kW Garden Patio Heaters are a fantastic option for anyone looking for quality yet affordable patio heaters - it includes two individual heaters! Both freestanding heaters are adjustable, with heights of 174.5cm and 210cm available. As electric patio heaters, they are an eco-friendly option - not to mention much cheaper to operate - than their gas counterparts, making their affordable price seem even more of a bargain. Better still, they come with versatile heat options should you need to adjust the warmth. Starting at 650W on the lowest setting, you can increase this to a much warmer 1350W and 2000W at the flick of a switch. These settings are great for the different seasons! Because they utilise infrared lights, the heating provided isn’t impacted by heavy winds or cold air, meaning you always get a steady warmth from the heater regardless of the weather. This also doubles as a nice outdoor light, setting a comfortable ambience anytime you sit outdoors. Made from steel, each heater can be left outside without fear of damage, although their IPX4 approval means they can used indoors too - talk about versatility! The Castmaster Luxury Gas Patio heater is a high-quality product found outside many pub and restaurants. Powered by gas - with the option of both propane and butane for fuel - this heater provides an impressive heat that will keep you and your guests warm during your outside gatherings. With an adjustable heat setting ranging from 5 to 12kw, expect to get around 15 to 30 hours from a single tank of gas. The large four-piece heat reflector allows for an impressive coverage, and igniting the heater is very simple due to the piezo ignition. Safety is of the upmost important with this patio heater, with a range of features to make it much safer. This includes the latest anti-tilt and auto shut down technologies, which ensure the heater always turns off when tilted at more than a 20-degree angle. You also get a free ground anchor to help stabilise the heater, while the free wheel set lets you transport it around your garden with ease. Once the weather gets too bad to enjoy, simply use the free cover to provide exceptional winter protection - this helps to guarantee longevity! Despite its much smaller height (133cm) than traditional freestanding patio heaters, this patio heater has all the power you could need to warm guests in your outdoor living area. What it lacks in height it makes up for in power - this heater has an incredibly powerful output between 5000W and 13000W. Boasting a sleek stainless-steel bullet design, the heater is a strong and durable piece that will last for many years to come. Starting the heater couldn’t be easier thanks to the piezo batter ignition, while you can switch between preferred temperature outputs to get the desired warmth. 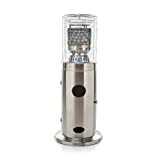 The Bullet Gas Patio Heater can use either butane or propane for fuel, although it comes with a free regulator that is for propane use only, so it’s a good idea to stick with propane in most cases. Storing the gas cannister in the chunky base is easy enough, and should the heater ever be knocked over the anti-tilt feature kicks in to prevent any accidents. While it’s made from durable stainless steel, it’s a good idea to invest in a cover to protect it during rainy weather, or simply store it a garage or shed when not in use.